International Series of Monographs in Analytical Chemistry, Volume 47: Analytical Chemistry of Molybdenum and Tungsten describes the chemical and instrumental methods of analysis of molybdenum and tungsten. 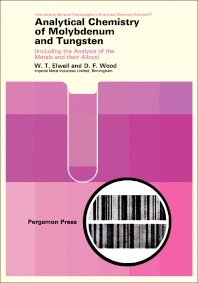 This book is composed of 15 chapters that particularly consider detailed methods for determining these metals in typical samples and their alloys by both classical and modern techniques. The opening chapters discuss the history, occurrence, physico-chemical properties, and applications of molybdenum and tungsten. The succeeding chapters deal with the metals’ sampling, decomposition, separation, and qualitative detection. Considerable chapters are devoted to various chemical and instrumental methods for their analysis, including gravimetry, titrimetry, colorimetry, polarography, amperometry, coulometry, emission and atomic absorption spectroscopy, X-ray spectrophotometry, mass spectrometry, and radiochemical methods. The concluding chapter examines the determination of impurities and alloying elements. This book will prove useful to analytical and inorganic chemists, as well as analytical and inorganic chemistry students.